← What’s a Hand-blended Tea? There are tons of tea terms out there, so many, in fact, that noted tea aficionado James Norwood Pratt put together a Tea Dictionary. It includes all principal kinds of tea grown in the world, with a timeline of tea history, maps, and striking photography, mostly by Yoon Hee Kim. 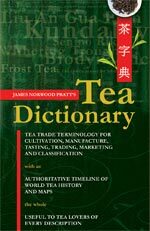 The dictionary covers terminology for tea cultivation, manufacture, tasting, trading, marketing, and classification, with an abundance of botany, business, history, folklore, and “… almost all the gardens and place names we think worth listing.” It is the first work in English to include Chinese characters whenever possible and is intended to be an indispensable tool for tea lovers of every description. Never fear, though, since there are about 15 tea terms that you can learn and be able to communicate effectively and knowledgeably with other tea lovers. Camellia Sinensis (or Camellia sinensis) — Botanical name given to the tea bush. Flush — Refers to the timing of the tea harvest. First flush is the early spring plucking of new shoots. Second flush is harvested late spring through early summer, yielding more body and full flavor. Autumnal flush is the late season harvest. a. Black — fully fermented and withered leaves; brews a reddish-orange or reddish-brown infusion. b. Green — leaves that have been neither fermented nor withered and are then fired to cease fermentation; brews a pale, greenish-yellow infusion. c. Oolong — partially fermented and withered leaves; brews an amber infusion. d. Pu-erh (also “puer,” “pu-er,” “pu er”) — specially fermented and then aged leaves to produce an earthy characteristic. e. White — withered and then fired leaves; brews a pale greenish, almost clear infusion. f. Yellow — a rare type of tea yellow in color (both leaves and infusion) due to slow oxidation that makes it sweet and mellow tasting without the grassy characteristic of green tea. Oxidation (also called “fermentation”) — The process of breaking down cell walls in green tea leaves and letting in oxygen to make black and oolong teas. The amount of oxidation can range from very little to 100%. Oolongs are usually semi-oxidized and then fired and dried, often yielding a citrus or fruity flavor depending on the master’s craft and skill. Withering — The fresh leaves sit for some period of time after plucking to reduce moisture content. Firing — Rapidly hitting the tea leaves with hot air or in a hot pan in order to quickly cease fermentation and dry the leaf. Sorting — Sifting the different leaf size particles through different size meshes or hand-selecting leaves from a batch that meet a particular criteria. Orthodox — Prepared using a technique which leads to larger leaf styles. CTC (Crush, Tear, and Curl) — A machine-based process which chops up the leaves by pressing them through counter-rotating rollers; brews up a stronger, more highly-colored tea. Fanning — Small, grainy particles of leaf. Dust — The smallest size of tea pieces, produced by machine and used in many bagged teas. Blend — Two or more varietals of tea mixed together. Flavored — Tea leaves with spices or flavors added, such as cinnamon, orange rind, or Bergamot oil. Rinsing (Washing) tea — Pouring hot water over tea leaves for 10-15 seconds prior to using them for brewing tea. Some people do it while others do not. Infusion — The process of extracting elements from tea leaves by submersing them in heated water. This should get you started on speaking with other tea folk and knowing what they’re saying. This entry was posted in Tea Info for Newbies and Up and tagged JAS-eTea, tea terms. Bookmark the permalink.